Here is another picture of Hammarby Sjöstad, with Sickla Udde in the background. 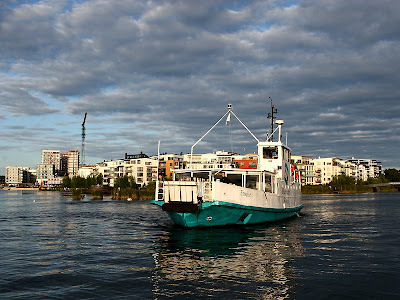 The ferry is M/S Emelie, leaving Hammarby Sjöstad for Stockholm City. Gee this is a lovely shot. The water, the sky, the boat, everything is just so perfect. You should be very happy with this one! Thanks Kris!! I am happy with this picture. And I am very glad that you like it too. Thanks a lot! Wow, great pic, lovely reflections and light! This is something to show those people who insist on believing that life in a "big" city like Stockholm is dark, polluted, dangerous and generally depressing. I agree with Kris and Pia - doesn't get any better than this.